Landesknecht Sword for Chris Artman ! Chris has asked me to post the results of a commission we have been working on for him for quite some time. 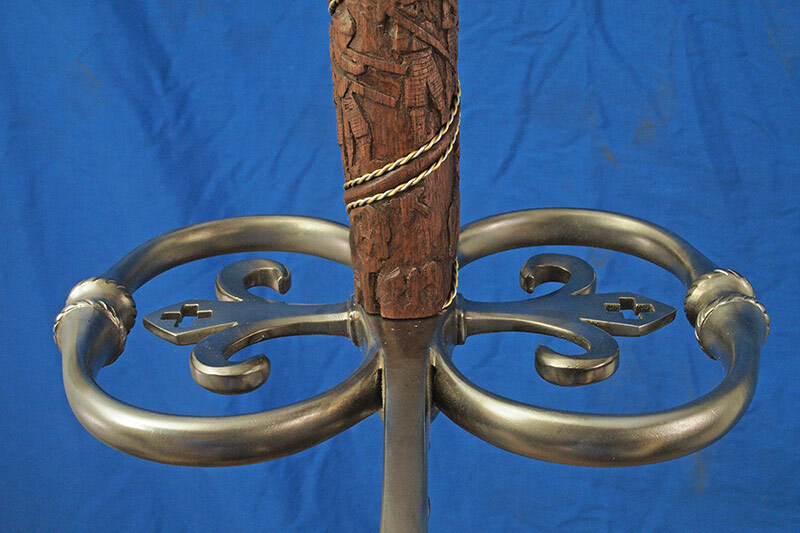 He wanted to create a piece that was a high status example of a Landsknecht Two Handed Sword. Something to really show off some detail and style. The job started with some great sketches from Chris showing some the elements that he wanted in the project. The fluted ball on the mid grip, the pommel form, details of the guard and the blade form where all things he laid out. While inspired by historical examples this would definitely be guided by Chris’s design requests and an ongoing discussion through out the process about what we could do to take it over the top for him. The blade in flammard in style and the furniture are steel. 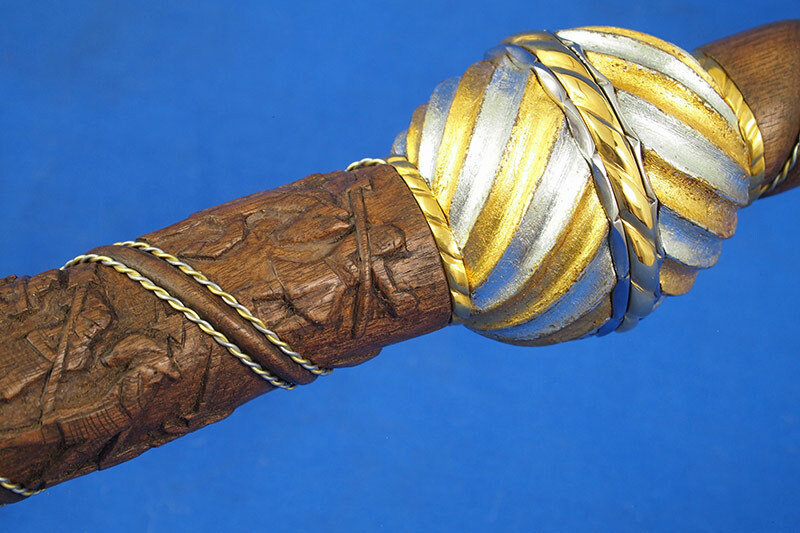 The grip is walnut with bronze and steel twisted wire and discs plated and leafed. The guard has a real sculptural quality to it with lots of variation in the depth and breath of the components. The unique flourish under the guard coming down the ricasso was an element he wanted in particular and adds some elegance to the design. It has a large 22 inch span. 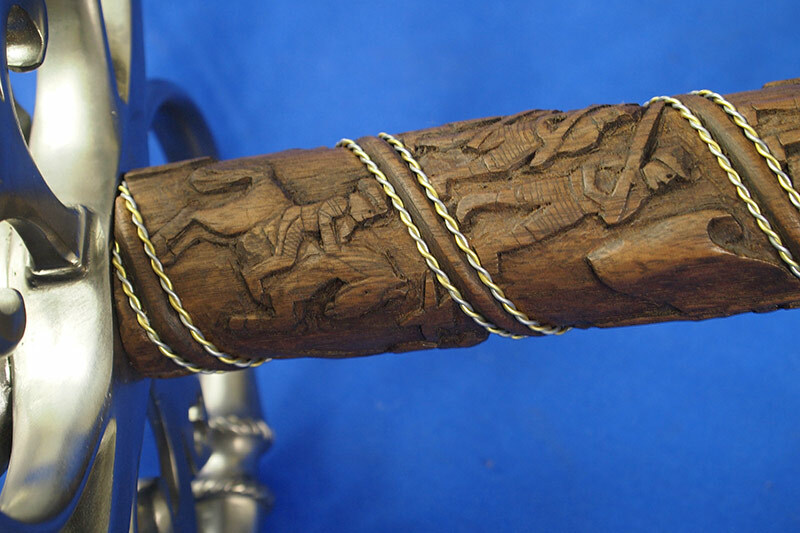 The lower grip was inspired by the triumphal marches of landsknechts in art of the period. This was an idea we brought to the project and Chris thought would look good. I think it really took the look of the sword up a level. The silver and gold leaf on the fluted walnut mid ball was another suggestion from us and it is accented by gold plated metal discs decoratively cusped above and below as well as in the middle. The sword moves well in the hands but is large enough that one would need to take care in wielding such apiece. You cannot muscle this one. It really does dominate the room when you see it and would certainly make one look twice when you saw it coming down the street over a soldiers shoulder. The sword is massive in size, which was part of the goal. Impressive in every aspect we hope this sword meets Chris’s expectations on arrival. It's been a while since I posted. I mentioned I was working on a 2 hander as my next big project. So this was it... looking forward to receive it this week. That's mighty fine. You folks have been working hard. That grip reminds me a little of Trajan's Column. Wow - that is really something else. Pretty incredible piece of work. Craig, I think that's one of your finest achievements. Congratulations Chris, that's a splendid sword. Wow, what a sword! It's almost as tall as I am, and far more attractive to boot! Congratulations to A&A and Chris for this great project - may it bring many decades of satisfaction. I've never really gotten on board with the flammard blade style, but this sword somehow does it for me. It may be the straight centerline rib with the rippled edges--who knows? This piece is wonderful and unusual and really catches the eye! You know it's a big sword when it makes a poleaxe look like a toothpick and a katzbalger look like a toy. Lots of masterpiece touches here, the doppelsoldner carrying this wouldn't have to rely on much else to get his point across...Congrats Chris, but I hope you build a landsknecht kit worthy of the rest of this, puffed slashed sleeves and all! 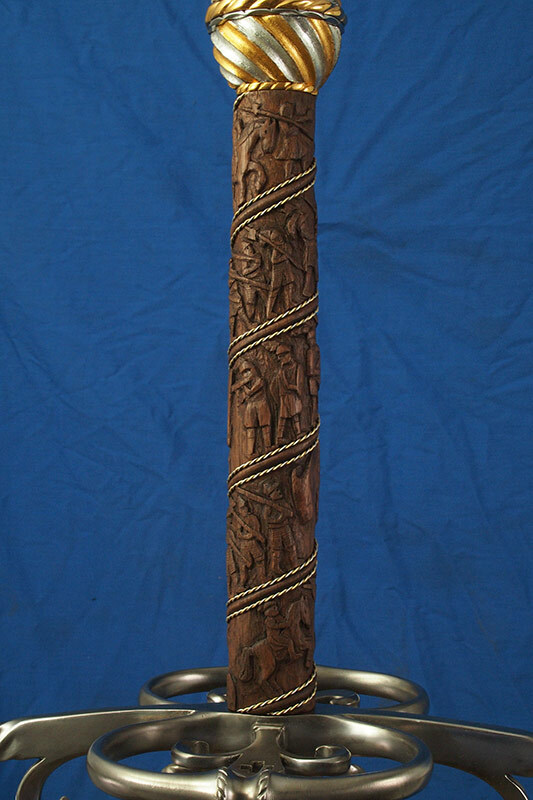 Superlative work...the grip is magnificent, and a very striking feature, a very ambitious project in itself. 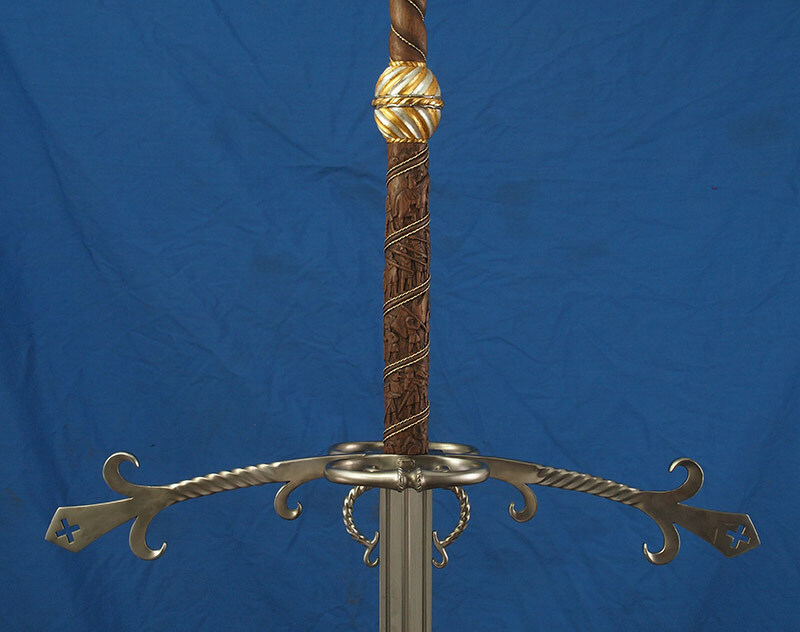 These type of sword would rarely hold my attention, but man, this one is superb. Very very well done. This thing is more than half a foot taller than me. I would look like a cartoon character swinging it around! This thing is jaw dropping . Absolutely gorgeous. Chris - I had the privilege of collaborating with Craig on my Zwiehander many moons ago (it`s the one on the custom page on the A/A website)and understand an appreciate that process . I have had the opportunity to watch your piece grow in the process of it`s birth and I am truly in awe of what the two of you have accomplished. How thick is the ricasso? The ricasso is 1/4" thick. The full thickness is through the lugs and then begins to taper. That seems awfully thin, is that common in historic examples? While I would not say common it definitely appears. I have seen a couple of pieces that where thinner, but I have also seen some start at nearly 5/8 of an inch. One of the elements of working with standardized stock in the modern day we sometimes forget that the originals would have been done to the eye of the maker in most cases ending up where they wanted not so much building to a ruler.